Thanks to the fabulous Maggie (thesaladgirl.com), I finally found PB2 at store in my local neighborhood. I know several of you have been raving about PB2 for a while now, but until recently I had never tried it. Now that I've tried it, I have to say, those of you that have been raving about and recommending PB2 are so right. I was skeptical given that it is a powder, but wow, it is really delicious! 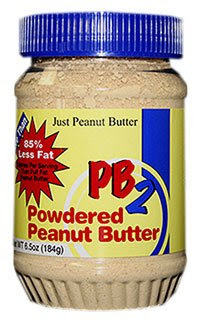 For those of you who've never heard of PB2, it is a powdered peanut butter that comes in regular peanut butter packaging (this confused me for a while). To turn the power into peanut butter, you combine two tablespoons of the PB2 powder with 1 tablespoon water at which point it turns into really thick, creamy, tasty peanut butter. Alternatively, you can also add the powder directly to a smoothie or yogurt for some delicious peanut-y taste. Two tablespoons of PB2 (enough to spread in a la tortilla factory soft wrap) are 53.2 calories, 1.87 grams of fat, .48 grams of fiber, and 5.65 grams of protein (so only 1 weight watchers point). Ingredient wise the powder consists of peanuts (they are slow roasted and pressed to remove all the fat), sugar, and salt. It also comes in what looks like a yummy chocolate flavor, but I haven't had the opportunity to try the chocolate flavor yet. One of the reasons I wanted to post about PB2 was so that I could post about a low calorie peanut sauce recipe that leverages it to eat with thai spring rolls. I will do this posting next week so stay tuned! Finding PB2 might be challenging. It is available online through the company that makes it called Bell Plantation. They have a store locator on their site so you can find PB2 at a store in your neighborhood. I was just eating this! I actually ended up ordering more from the website and it ended up being cheaper. I tried the chocolate and it's decent - I prefer the original though. Unfortunately they don't carry in any store near home.... but I don't want to order 4 jars without trying them. Besides, I'm still with 2 open jars and 2 unopened jars of Peanut&Co. but when I finish them, I'll definitely try this out! Yes I have heard alot about it from other bloggers as well. I have not seen it at the stores though. This sounds intriguiging! I like that it has so much less fat than regular peanut butter. Ah, I LOVE to use this stuff in smoothies, yogurts, oatmeal, and sauces. It's fantastic! I read about this product some time ago and then promptly forgot about it. Would love to try it, especially mixed into my chocolate yogurt concoction. I love that its so low in fat. Thanks for the reminder, Juliet, I need to look for it while I'm grocery shopping today. I have been wanting to try this after seeing it on a few blogs. i am going to see if I can find it around me - thanks! my boyfriend and i L.O.V.E. peanut butter but it is so fattening. what a great alternative! never heard of/seen it before. is it as creamy as real pb? peanut butter's main health benefit is the unsaturated fat; it's an incomplete source of protein. i don't understand why you would purposely remove it. I have a major love affair going on with PB2!!!! I cannot imagine life without it! I have tried the chocolate PB2 (they sent me a sample) and quite honestly, I couldn't tell the difference b/w it and the regular PB2. So, I won't be ordering that just the original. Have fun with it; so many different ways to use it! I fell in love with this powdered peanut butter the second I tried it. I will admit I was hesitant at first, cuz I mean... it's powder! LOL But I was verryyy impressed with it. It's now a staple in my pantry (along with Better n' peanut butter). I use both, depending on what I'm doing with it. I just loveee how SIMPLE the ingredients are in PB2. Ha, so funny, I'm actually eating PB2 right now. I love this stuff so much! Deliciously amazing. I pay way too much for it to get it shipped in from the States. It's worth it though. juliet, this stuff is soo cool!! i've seen it on celine's blog before because she uses it in her baking. i've got to try this stuff. Gosh now all of you are getting me hooked on wanting to buy this item! Juliet, I am going to buy other Amy's product next time I go shopping again and let you know how it goes! I've been hearing about this PB2 everywhere. Definitely a MUST try now. I bought some a few weeks ago but had to order on line. I have both the plain and chocolate. They're good but really don't replace the real stuff. I use mine in my morning protein shakes. Gosh I hate to be a stick in the mud, because it sounds great but my friends son is deathly allergic to peanuts. It is a bit spooky how this could end up in more places now that he has to look for. but in another note, have you tried it not mixed with water? how is it? Dont get me wrong, I love PB I will for sure try it , I am just more aware of the allergies with my friends son being my daughter's age. Hey, has anyone noticed that on the new version of PB2, which I LOVE by the way, has the unfortunate occurence of having trans fat on it? I wonder if this is naturally occuring or artifical do to the defatting/heating process it goes through. I haven't noticed it on old version though. That's not good. I will keep my eye out for that on the next PB2 I buy. I live in the bay area too, where did you buy it? the site only lists east coast places...thank you so much! i love your blog. How is this compared to Peanut Wonder? Found this the cheapest at netrition.com, reasonable shipping too. We mix it with coconut oil. I have heard about this product at Weight Watchers, its not to be found anywhere here in Michigan, people have ordered it off the web but they keep getting letters that its on back order. I actually tried the other brand, and got hooked theirs! They've got some tasty stuff. Ooooh, my mom bought some of this and LOVES it. It is really hard to find though! She was supposed to split hers with me, but I think she's holding out on me....must be some good stuff! Hi, i live in Italy and here we have only the full fat peanut butter, unfortunately. Can you tell me a site where it's possible to order it online, please? Have you tried Trader Joe's Peanut Flour? It's basically PB2 sans the sugar and works exactly the same way as PB2 with water. It's a lot cheaper for a lot more. No, but that sounds delicious! PB2 mixed in Fat Free, Sugar Free, Chocolate, will taste like Reeces Pieces.